When @stitches.blog threw down the Colourburst Challenge last fall, I had no idea how far it would push me. Black background? Bright colours? Rainbow thread? Never going to happen in my quilts! I didn’t know all the quilting rules in my head until I broke so many of them in my “Night Garden” project. Knowing the background fabric that my daughter had chosen, I felt I needed something different. Northcott Stonehenge, a perennial favourite fabric line, provided an answer. Choosing nine different fabrics for four bright colour blocks led to ongoing stash searches, one visit to Oakville Sewing Centre and multiple trips to The Hobby Horse in Glen Williams. Who would have thought I could put strawberries, daffodils and butterflies into the same quilt? But the need for so many fabrics led me to risks I wouldn’t normally take. And for the first time, I made a quilt back that rivaled my quilt top–I couldn’t bear to waste all that beautiful fabric left from the log cabin blocks. That said, I like my daughter’s finished quilt top slightly more than my own. I find the colour scheme more appealing. I like the charcoal grey background, and the variegated grey thread is very pleasing to the eye. Still, I’m rather proud of my own “breakthrough” quilt. Thanks, @stitches.blog, for pushing me to colour outside the lines. My quilting will never be the same! This quilt was done as a commission, which is unusual for me. My client asked for a baby quilt for a boy in shades of grey with a wolf motif. For my birthday I received a selection of gorgeous grey fabrics that have related feather designs. I’m working on a lap quilt using these fabrics but decided to set some aside for the commissioned project. I used a hit and miss design for the blocks with 3 inch by 6 inch rectangles arranged randomly. The quilt is 7 blocks by 16 in total. I searched the internet for a one line wolf image to use for some of the blocks, then drew the design freehand on a sheet of paper and transferred it to the quilt top using a temporary light box and a gel pen designed specifically for marking quilts. I quite enjoyed quilting over the lines to create the 7 wolves; I think they look beautiful. Also for my birthday I received the book East Meets West Quilts by Patricia Belyea. In the book I read about the concept of “The Unexpected Visitor” (a surprise visitor that makes the party even better than the hostess planned) in quilting. It’s something I have done intuitively in quilt design before, but I tried to incorporate an unexpected visitor consciously this time. Can you find it? OK, I’d better tell you – it’s the plain very dark grey blocks, there are just four of them, and I really like they way they offset the other coordinated fabrics. I thought of doing something more wild and exciting (lime green is my excitement go-to) ; maybe next time! I chose a scrappy binding, and a bright one-piece backing with a large-scale grey floral to ensure the quilt is lively as well as having an overall calming effect. Once again I was attracted to that stack of fabric chosen for the Colourburst challenge. I wanted to see what a colour array of flying geese would be like against the dark grey background. Initially, I planned to have just the one strip of flying geese and use the dark grey for the rest of the quilt. But when I started putting it together, that seemed too stark for a baby quilt so I added the three long strips of green, blue and purple. For some reason, even though there are orange triangles in the flying geese array, a long orange strip didn’t look nice so I left it out. The flying geese units are 5 inches by 2 3/4 inches, and the quilt measures 34 by 35 inches. I quilted feathers on the wide grey strips, ocean waves on the coloured strips, and quilted in the ditch for the flying geese. I am so pleased with the outcome and looking forward to using flying geese again, and also continuing to work with this beautiful set of colours. Last week I was overwhelmed by an insatiable urge to use leftover fabric and scraps to make doll quilts. It’s still going on, I am working on doll quilt number 14 at the moment. There is something very satisfying about seeing the scrap pile dwindle away, while at the same time completing tiny perfect doll quilts. As I work, I can’t help but imagine the tea parties that dolls will be able to have on these quilts, and the lovely beds they will be able to sleep in. This is also an excellent opportunity to practice my free motion quilting on small manageable projects, and overall therapeutic. Recently, my insatiable sewing urge has expanded into felt dolls, and I am trying to perfect a simple felt doll pattern. The felt is so easy to work with – no fraying, and I am using my stash of novelty fabrics, stripes and polka dots for the doll dresses. I picked up an Animal Quackers fat quarter collection plus a charm pack and couldn’t resist using it right away. The pinwheel design is made from half square triangle blocks arranged at different angles. I really enjoyed the free motion quilting. I used an orange peel pattern for the pinwheel section, and feathers for the border. The quilting process was surprisingly easy and quick. To make the half square triangle blocks, I started with 5 inch squares (because that was the size of the squares in the charm pack). I matched up pairs of squares and put them face to face, drew a line with pencil diagonally, sewed a quarter inch on both sides of the line, then cut along the line, producing two HST blocks. If you look very closely, you may notice my points are not perfect. Unfortunately, that’s because I trimmed up my rows to an even width, and in some cases cut too far into the points. On the bright side, I think my free motion quilting is beginning to improve. I was able to produce more flowing and beautiful feathers this time. Next, I am finishing up the second baby quilt from this collection, then plan to make some smaller items for a craft show in November. I also have two new original quilting designs in mind. How did I ever have time for a full-time job? Here is the second quilt made from the Beatrix Potter fat quarter collection. It’s an Irish Chain, but reversed so that the cream fabric makes the chain and the coloured fabrics are the majority of the quilt. 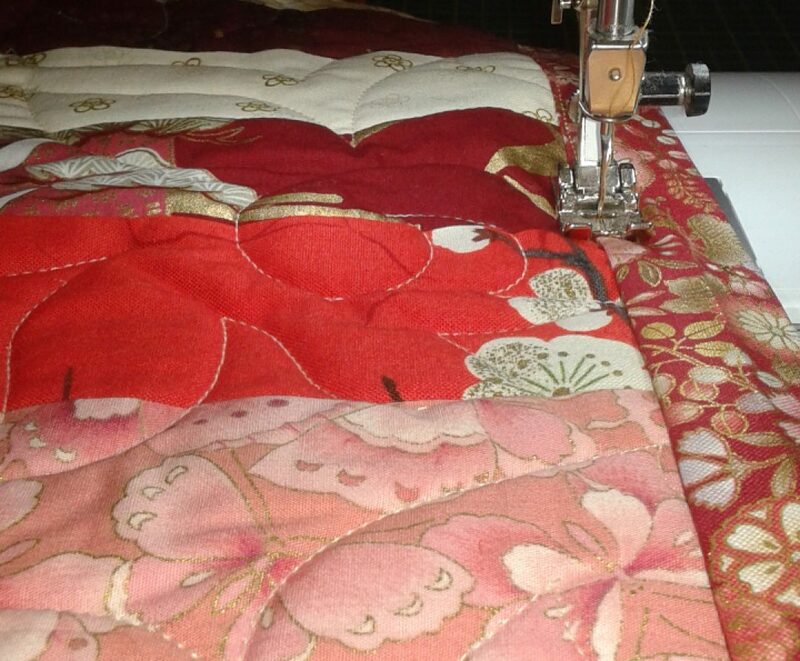 Once again I used a scrappy binding, and quilted with a mixture of the walking foot and free motion. Finished blocks are 9 1/2 inches, with a 3 inch border. It was much easier maintaining accuracy with the larger blocks. As I finished piecing the quilt top I realized there was still quite a bit of leftover fabric, so I came up with a personal challenge: to use every last piece of the collection in as many designs as possible. In this case, I think two more baby quilts are possible. Not bad for a collection of 11 fat quarters, some plain cream fabric, and a small amount of coordinating fabric from my stash.